Escape the real world into a virtual experience of your choosing! Every geek loves the idea of submersing themselves in a virtual world. But what about regular people? Virtual Reality has been around for several years and still hasn’t caught on with the mainstream public. What will it take for something like Virtual Reality to work for everyone? The answer is Mixed Reality. Virtual Reality started with the gaming industry so players could immerse themselves in a game environment. Headsets were (and still are) bulky and heavy. The current leader in headsets is the Samsung GearVR. You place an Android phone inside it and use one of many apps to enjoy a virtual experience. It only works with those phones, so iPhone users can’t play. You can also get a cheap phone-based headsets at a local department store for $30, but they are even heavier and difficult to use. You can also pay a good bit for non-phone-based VR. The front runners are Occulus Rift (for $399 or a package at Amazon for the same price) and HTC Vive for $599 at Amazon. Both are quality devices that have huge industry support. Also, they require powerful computers (which should already be powerful if you are gaming). If you’ve seen a Saumsung Gear VR commercial, it shows some old people wearing the headset while everyone else in their family sits and watches them. How fun is that? The experience excludes others which, to me, makes it meaningless. I’ve also heard that many people become disoriented and even nauseated when immersed in VR for more than a few minutes. We need something that is not so closed-in. Next came Augmented Reality, which super-imposes informational displays in front of your eyes while you look at the real world. The first real attempt to accomplish this was called Google Glass. As you walked around in public, it would show you a text information display about what you were looking at. This display was projected onto a pair of glasses you wear. It looked so goofy, the public didn’t adopt it. There are still many efforts to produce Augmented Reality glasses or display devices, but it has not taken off. Then came the winner in future technology. Mixed Reality super-imposes anchored objects in to the real world. This means you and others can see the same images along with what you see right in front of you. Imagine the applications for educators or the medical field! It provides a shared virtual experience that includes your current surroundings. There are 3 main leaders in this arena. 1. 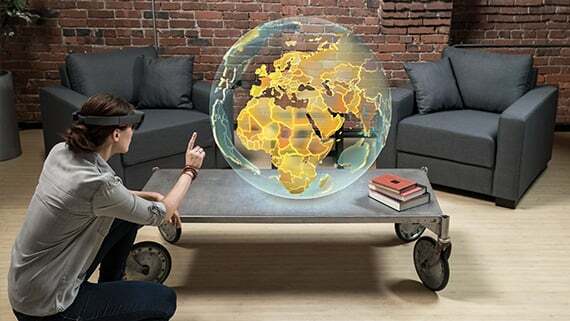 Microsoft Hololens has a head-start because they have an actual product and tons of support. After all, this is Microsoft. So they have lots of investment behind a cool looking product. Their commercial product costs $5,000 and a developer’s edition costs $3,000. So it is a high-end offering for now and not a likely solution for casual users. Notice no wires connected to it. I’ll talk about wires later. 2. Magic Leap has the distinction of being the largest venture capital enterprise in history. It has raised $2.3 billion over it’s 8 years in development and still has no product on the market. What makes it unique is that the glasses don’t project an image onto a screen, it projects images straight into your eye. The result is supposed to be images that look very realistic. Current images like on the Hololens look more “ghosty”. If Magic Leap can pull of this new technology (and many are skeptical), it will be a game-changer. 3. The Meta 2 by Metavision is the underdog in this race. They won the “Best Innovation” award at the Tom’s Guide CES 2018 Awards. Their product is available to developers for $1,495. The design looks promising! They call their headset Augmented Reality, but it looks to me like Mixed Reality. The latest hardware devices to hit the market are advertised as “Windows Mixed Reality” (WMR) headsets. They are NOT mixed reality, but actually just virtual reality. Made by Acer, Dell, HP, and Lenovo, the headsets are meant to compete with the Samsung Gear VR and HTC Vive at a slightly lower price point. They can be found at $200 to $250 when on sale. Here they are on Amazon: AcerDellHPLenovo. These devices run on Microsoft Windows Mixed Reality platform which, again, is not mixed reality. They also run Hololens apps. Several development platforms exist for all these headsets. The most prevalent for gaming are called “Unity” and “Unreal Engine”. Many games are made with these platforms and the latest headsets include support for them. Steam VR is also an add-on to help develop Steam games. The most promising platform for me is the one called Unity. It is free to use by one person and has lots of add-ons to make a rich VR, AR, or MR experience. I’ve been fiddling with it and plan to produce some content with it some day. Many of the devices I’ve talked about require a direct wired connection to a powerful computer. Mixed Reality won’t really take off until it is completely un-tethered so you can walk around in a mixed environment. Of the 3 MR headsets I mentioned it looks like Meta 2 is the only one that is tethered. The question I am asking is “How will Mixed Reality improve our lives?” If it will only be used as an entertainment escape, it could literally ruin our society. I believe Virtual Reality could do just that if it took off. Everyone in their own little world. But what if Mixed Reality can bring us closer together, let us engage with real people and other cultures, help us learn about the world, and assist us as we learn how to repair and maintain our bodies and world? Then, the mixed future looks very bright! It is my personal goal to get my hands on the 3 Mixed Reality headsets so I can thoroughly review them. P.S., If you want more details on the different realities, HERE is a good article.